The prevention of residential exclusion and the attention to people in vulnerable situations are priority axes of Barcelona City Council activity. The economic situation and the dynamics of the real estate market have led to many people living in inadequate conditions, losing their homes or being at risk of losing them. In order to defend the rights of these people, the City Council has enacted various policies. These measures have a transversal scope: aid and advisory and mediation services are available to prevent situations of risk, and when an eviction does take place, emergency aid is available to those affected by the eviction to ensure dignified rehousing. In this way, the City Council acts on the full range of situations that may affect citizens in regard to housing emergencies and residential exclusion. The aim of the City Council is to avoid the exclusion of people who are in situations of risk due to economic circumstances. This contributes to making Barcelona a more socially just city, as established in the Right to Housing Plan. What mechanisms does the City Council have in place for cases of eviction? In these sections, you will find all the services and aid that the City Council offers if you have lost your home or are at risk of losing it. You can obtain more information and assistance at the Housing Offices of Barcelona. Firstly, information is disseminated through the Housing Offices so that citizens are aware of their rights and the possibilities for support (advising, aid, etc.) that are available to them. Another important tool is mediation, which aims to find points of agreement between the parties involved. This service can also be requested from the Housing Offices, which help to negotiate with the property owner and search for housing alternatives. Finally, households can request aid for the payment of rent and mortgages in order to prevent conflicts over the property. What is SIPHO and how can it help you? The Service of Intervention in the Loss of Housing and Employment, or SIPHO, offers assistance to households affected by an eviction process. It provides advising services and information about legal rights. If is not possible to reach an agreement to stop the eviction and the eviction date arrives, SIPHO carries out the final negotiations and assists the families affected. There is aid available specifically to support people who are in an eviction process. You can see the key information in the following table. Applicants must be in an eviction situation and must hold a rental contract or be in the process of seeking housing. Prove the urgency and special need of the household by means of a socioeconomic report from social services of primary or specialised care, in which the granting of this aid for these reasons is proposed. The combined income in the household of the applicant at the time of submitting the application (monthly income weighted according to the number of people in the household and the zone in which the home is located) cannot exceed 2 times the weighted Adequate Income Indicator of Catalonia (IRSC, in its Catalan acronym) for a single person household; 2.5 times the weighted IRSC for households of two or more members; or 3 times the weighted IRSC for persons with disabilities or a high degree of dependence. A household is understood as the people registered at an address regardless of whether they are related to each other. The period between the date on which the home was left and the date on which the benefit is requested cannot be longer than 24 months. The date of entry into force of the new contract cannot be earlier than 60 days from the date on which the home is left, except in cases of dation of payment or other legal proceedings, in which case the period can be 180 days. The home must constitute the habitual and permanent residence of the applicant, and must be listed as his/her domicile according to the municipal register. No person in the household, including the applicant, may own any other residential property, unless it is unavailable for use and enjoyment. The applicant must hold a rental contract, an agreement of use or, exceptionally, a sublet contract for the home that constitutes his/her habitual and permanent residence. Neither the applicant nor any other member of the household can have kinship ties with the landlord (marriage, stable relationship, consanguinity, adoption or affinity, up to the second degree). The monthly rent that the applicant must pay cannot exceed 750 euros. 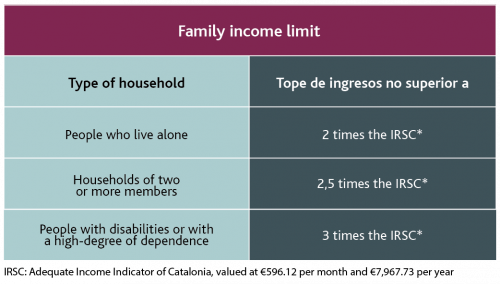 People living in a home managed by the Housing Agency of Catalonia are not eligible for this aid, nor are those who have been offered access to a home from the social housing pool and have not accepted it, except for justified reasons. Responsible declaration of the applicant, regarding whether other public or private aid has been requested or obtained for the same purpose, and presenting the detailed list of the entities that have granted aid as well as the amount requested and obtained, if applicable. Original and photocopy or certified photocopy of the identity card (DNI) or foreigner’s identity number (NIE) of the applicant and of all members of the household. If any member of the household does not have a DNI / NIE, an equivalent identification document must be presented. Newly arrived persons who have obtained a DNI must include the NIE that they had before the DNI on the application. Socioeconomic report issued by municipal social services of primary or specialised social care, regarding the situation of the household. Original and photocopy or certified photocopy of the last three payrolls prior to the presentation of the application. In the case of unemployed persons, the certificate/s from the employment office with the amount received during the last three months prior to the presentation of the application. In the case of pensioners, the certificate/s issued by the paying body or bodies of the amount to be received for the current year. In the case of self-employed workers, original and photocopy or certified photocopy of the last quarterly tax (IRPF) declaration. Working life report issued by the Treasury of Social Security for the applicant and all persons of working age in the household. This report must be ordered via the Social Security website or by telephone 901 502 050. Responsible declaration of the applicant regarding compliance with the requirements. Certified photocopy of the family record book, if applicable. Judicial sentence or separation or divorce agreement, if applicable. Documentation proving the eviction or foreclosure process of the home, or other recognised and validated intermediation processes in which the home where the applicant previously resided has been lost. Proof of having made three rent payments or six mortgage payments for the home, if the documentation of the corresponding process does not adequately show this. Receipts for all rent paid for the home for which the aid is requested, up to the submission date of application. The Housing Agency of Catalonia may request, directly or through the entities collaborating in the management of these benefits, additional documentation to complete their knowledge of the application submitted. The amount of the aid is set at 60% of the annual rent of the home, with a maximum limit of 2,400 euros per home. This aid can only be granted once and for a maximum period of 12 months. The aid is effective from the month following the submission date of the application. For cases in which a favorable resolution has been issued, conditioned by the contribution of the rental contract, the aid is effective from the month in which the contract was submitted. The amount of the supplementary aid for the deposit and access to a rented home is determined by the accredited expense, with a maximum amount of 600 euros, and can only be granted once. No more than three months can pass between the date of signing the rental contract and the submission of the application. Applications can be submitted at any Housing Office of Barcelona at any time of the year. Maintenance of the basic income for emancipation, obtained in accordance with Royal Decree 1472/2007, of November 2. Aid for the payment of the rent as provided by Law 18/2007, of 28 December, of the right to housing, when the object is the same monthly payment. When the aid is applied to different monthly payments, the sum of the amounts to be received in the same calendar year cannot exceed 3,000 euros. Obtaining subventions for the payment of rent as provided by the Agreement of 22 July 2014, between the Ministry of Development and the Government of Catalonia for the execution of aid lines 2013-2016. The same applicant can be granted aid for the payment of rent debts and aid for cases of eviction and the complementary aid for the deposit and payment of a new rented home in the same calendar year, provided that the sum of the different benefits does not exceed the maximum amount of 3,000 euros. The granting of this aid does not prevent a non-profit organisation, which has signed an agreement with the Housing Agency, from granting temporary aid to the applicant in advance, with the same purpose. The granting of this aid does not presuppose approval of the aid by the Housing Agency of Catalonia. These benefits are compatible with aid from other public administrations for the same purpose, provided that the sum of the different benefits granted does not exceed the amount of 3,000 euros and that they have not been obtained for the same year and for the same monthly payment. The Emergency Committee is a mechanism dedicated to assessing the situation of people at imminent risk of residential exclusion and referring them to housing for social emergency. To access this mechanism, the application procedures must be completed in any of the Housing Offices of Barcelona. In this way, a solution can be offered in the most urgent cases to avoid the social exclusion of people facing economic difficulties. The Committee is an entity created by the Barcelona City Council and the Government of Catalonia through the Housing Consortium of Barcelona with the aim of ensuring the right to housing for people at risk of eviction. Consult the regulations of the Committee. If you are in the process of eviction, you can seek aid and advising from the Housing Offices of Barcelona. The City Council provides the people affected with options for dignified relocation through various tools: the Emergency Committee (for the cases provided in its regulations), aid for the payment of rent, for loss of housing or other available resources. If you find yourself in a very urgent situation, you can ask for help by calling the Urgencies and Emergencies Centre of Barcelona (CUESB), at the toll free number 900 703 030, which has a specialised team that will assist you if you need temporary emergency accommodation.